Filippo Pozzato (Lampre-Merida) ended a spring season to forget when he finished 50th in yesterday's Paris-Roubaix. This time, however, the Italian felt good all day but several mechanical setbacks derailed his race. Having already performed below expectations at E3, Gent-Wevelgem and the Tour of Flanders, Pozzato was again off the mark in yesterday's Paris-Roubaix as he could only manage 50th. After Flanders, the Italian had complained about a paradox as he felt good but lacked the acceleration at the key moments in the race. Yesterday he had again enjoyed good legs but this time he was slowed down by several mechanicals. "When you have to face two punctures and in a key moment another rider hit your derailleur, it's very difficult to be still competitive, despite your best efforts and good form," he said. "I was not hurt. The feeling were better than those I had in Flanders, even so good that I could exit the Arenberg forest in the top positions, but then I had two punctures. I was able to get back. "At 40 km to go, when Cancellara attacked, the problem with the derailleur which was accidentally hit by an opponent, ended all my aims. It's a pity, my legs were good." An in-form Davide Cimolai was another protected rider on the Lampre-Merida roster but like his captain he had bad luck. "I was doubly unlucky, because I had the puncture in the same moment as Pozzato," he said. "In these events, it's almost impossible to come back to the main group. So this accident ended a race that was quite good for me, considering that I was in the top positions after Arenberg." Sacha Modolo made his debut in Paris-Roubaix but luck was not on his side when he was riding near the front in the Arenberg Forest. "I had a puncture and my wheel slid on a stone, so I crashed," he said. "I hit my chest on the ground, I felt pain and I could not get back on the bike. "I'm quite angry because I was feeling comfortable on the cobblestones, I had no problem in riding my bike and I think I would have been competitive in my debut in Paris-Roubaix." 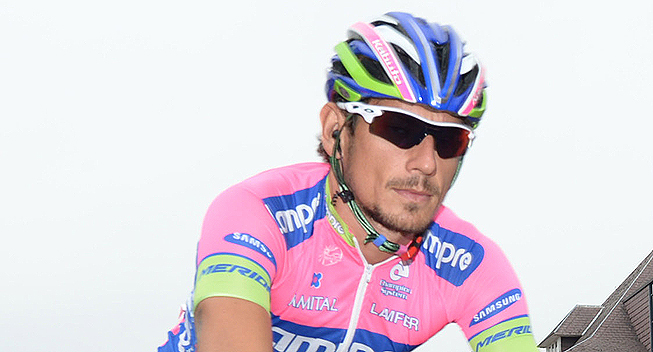 In addition to Pozzato, the only other Lampre-Merida rider to reach the finish was Andrea Palini. "I had some mishaps, but I like this race so much that I have always found the strength to continue and not abandon the race."